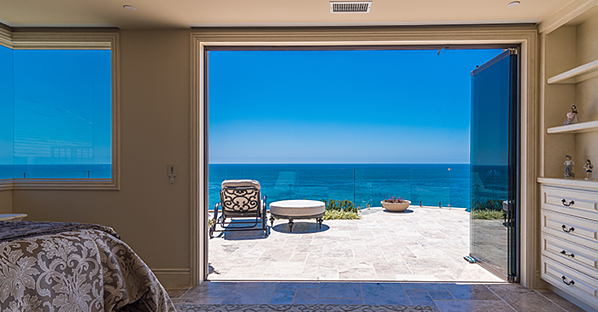 Boasting an incredible ocean-front view of the Pacific, the Liebman’s came to Cover Glass with the idea of transforming their indoor/outdoor living space into something gorgeously efficient. 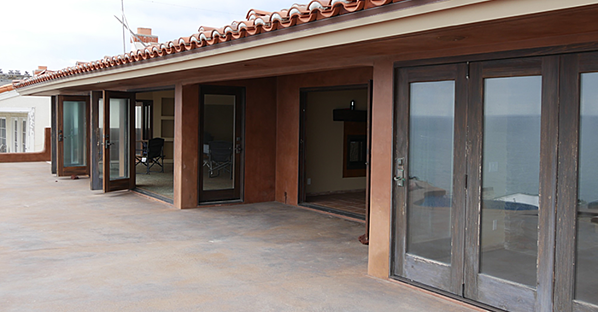 As a unique product, Cover Glass’ Frameless Sliding Glass Doors help gives this extraordinary Dana Point beach haven the facelift our customers were looking for in terms of both quality and a profound shift in the home's overall appearance. Ultimately, the Liebmans were looking for a way to enhance and transform the way they lived via more entertainment space, a seamless transition between the inside and outside living areas, unobstructed views, natural ventilation and added home value. Let’s take a walkthrough and explore how Cover Glass revitalizes this beautiful properly with the addition of Cover Glass. Three individual [Frameless Sliding Glass] openings, totaling 42 feet in width. 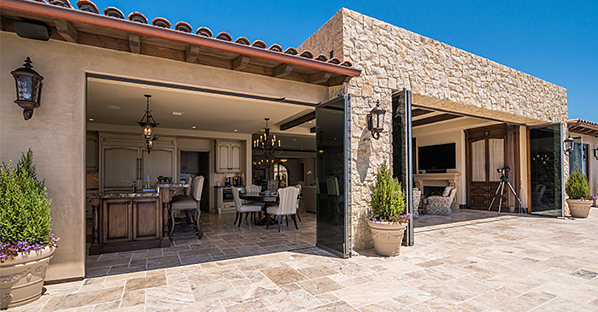 Each system provides seamless access to outdoor living space. Flush bottom tracks so indoor/outdoor flooring mutually blend. 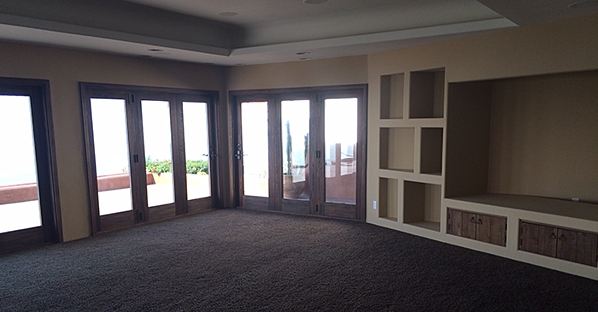 Panels stack neatly on sides to maximize entertainment space and ocean view. Throughout the home renovation process, Cover Glass worked closely with our customer/home contractor to ensure flush flooring, as recessing the bottom tracks to sit smooth and consistent with the indoor/outdoor floor covering, was a priority. 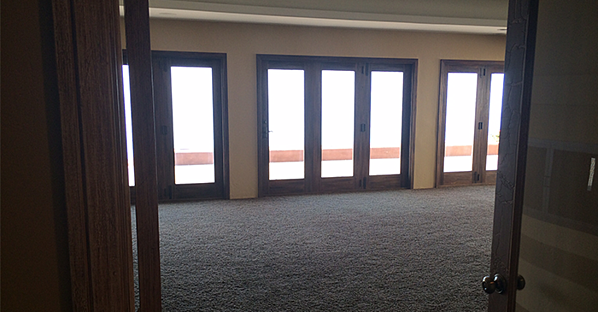 As you can see, natural light and ventilation were significantly reduced with the previous design of the doors. Consequently, this made the overall interior of the home darker and the overall ambiance subdued and dull. The Liebman's idea to create a seamless transition between the indoor/outdoor living space stems from the image seen above. The design demonstrates how the doors obstruct the view from the outside and strongly discourage usage of utilizing both areas collectively. What a difference Cover Glass makes! 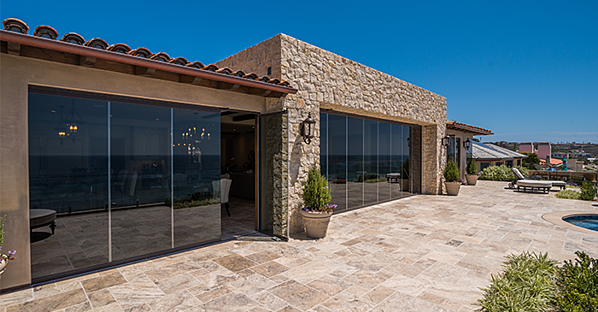 These Frameless Sliding Glass walls [gray glass color variation], coupled with the beautiful addition of the exterior stone structure, maximize viewing and declutter the home's overall appearance. When the system is complete open, the bottom tracks beautifully blend into the flooring, creating a seamless transition between the floor design [inside and outside]. In fact, the transition is so seamless, it's hard to know whether you are inside or outside. Talk about welcoming the outside in! Cover Glass helped the Liebmans leverage their astounding view by helping connect Mother Nature with the indoors. It is a beautiful sight, wouldn't you agree?